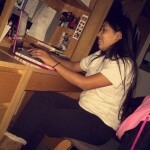 Gabriel “Fluffy” Iglesias at Loyola! Saturday night was epic. I mean I’m a girl that always cracks up jokes, even when I’m the only laughing time after time. So for me to see Gabriel “Fluffy” Iglesias live was beyond perfect! I am so glad that my boyfriend talked me into buying tickets! After a crappy week of feeling super sick it was nice to feel better and laugh my tears out! Before the show started there were already many, many people lined up at the entrance of the doors. It was worth the cold wait, as we were not too far behind! We were able to get floor seat, but TO MY LUCK I sat next to a tall person (I’m only 4’11). Even though, I couldn’t get a direct view of Fluffy, I was still able to see him perform via the screens. His friend and the famous “Maaaaaartin” kicked off the show! Following him were two other comedians until Fluffy came out. I cannot express how funny he was! At one point my boyfriend was in tears. Unfortunately, we were refrained from taking pictures and/or videos. My favorite part was when one student “booed” Fluffy when he stated that hybrids were a good example of doing “good to nature.” Fluffy just said “Oh, really?” and went through an entire joke to shut him up. He picked on him for the rest of the night. Actually, I do not think that he ever got to the hybrid joke because he trailed off saying other ones. He truly is a stand up comedian because he would just start talking about anything and everything. His jokes were effortlessly! Fluffy went an hour past what he said he was going to perform. At one point he was so fed up with the time he unplugged the timer! He ended the show with old, classic jokes. He did say that he didn’t like to repeat old material, but everyone was chanting out that they wanted the old jokes! He sighed and said: “Fine, y’all better still laugh, though!” Once he started it seemed like a unified chorus. Everyone knew what he was going to say, and it was so funny! I am so happy that Loyola brought him to Colossus 2015! 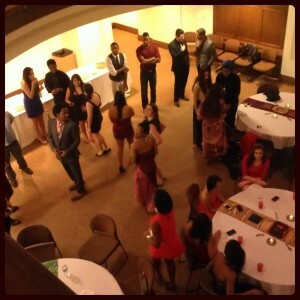 The DOP staff at Loyola did a great job; it was such an organized event. I had SO much fun! I cannot wait to see him again. I absolutely love the placing of Damen. It was my lifesaver during winter when I needed to catch the L. Its placement is perfect, and it allowed me to stop for a coffee during those chilly, chilly days! I do have to admit that sometimes I try to avoid all of the people by the desk, who are trying to stop you, for the merely reason that we can all be a little socially awkward. Sometimes the guy handing out stuff is way too cute, but I am having one of those bad hair days, didn’t do my nails, raccoon and baggy eyes day. So, yes, forgive me, but I will avoid eye contact and walk past you. However, on most occasions, I still take the time to talk and receive whatever they are handing out! This past week, I am so glad that I did just that. They used a medal to catch my attention and it did because it definitely made me stop. 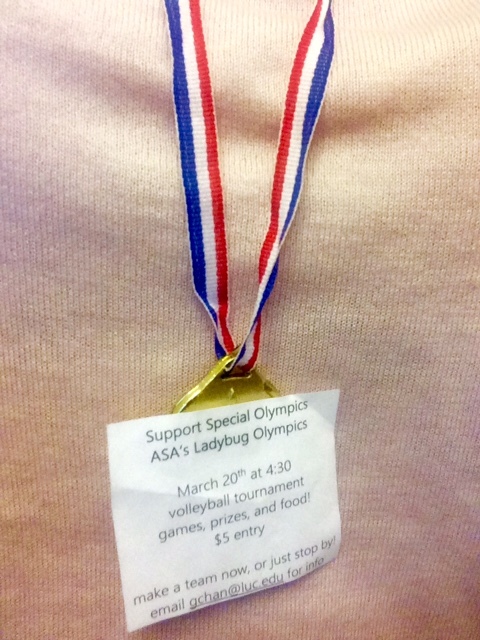 ASA is hosting a Ladybug Olympics to support Special Olympics. I thought this was very thoughtful and original. 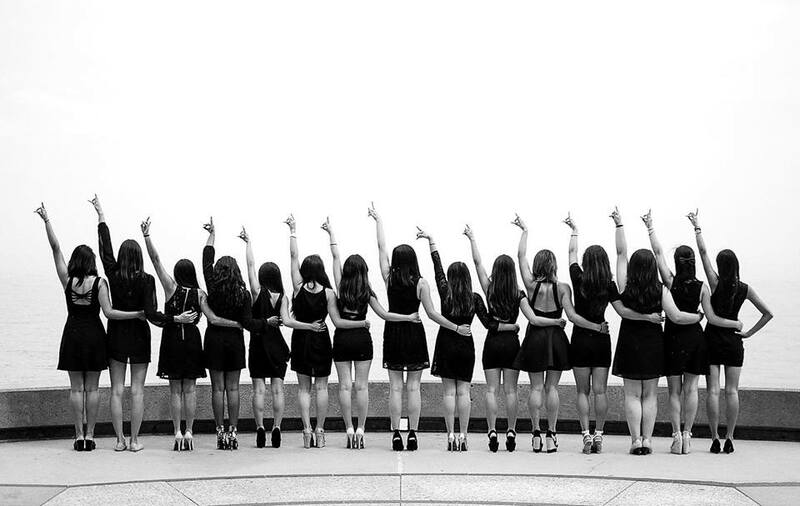 I enjoy seeing how active the sororities are with their philanthropies! I wish I had a team to participate, so if anyone is up for it, I would love to be part of a team! The event is on March 20th at 4:30 P.M. 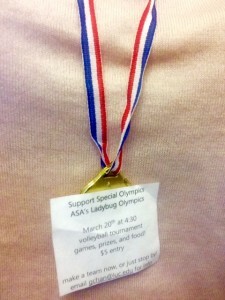 It is a volleyball tournament with games, prizes and food! 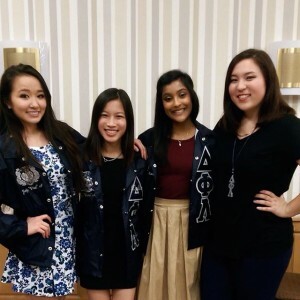 If you want to make a team email: gchan@luc.edu for info. You’re the first one to go to college and you’re clueless, but it’s OK. I, too, am a first generation student at Loyola University Chicago. I am also an only child and I did not have any close relatives attending college in 2010; it was difficult, but I did it! Here are some tips that worked for me! REACH OUT EARLY. This is the most important and this is why it’s my first tip! Talk to your counselor/advisor asap. If you know you’re major advisor, talk to him or her as well. 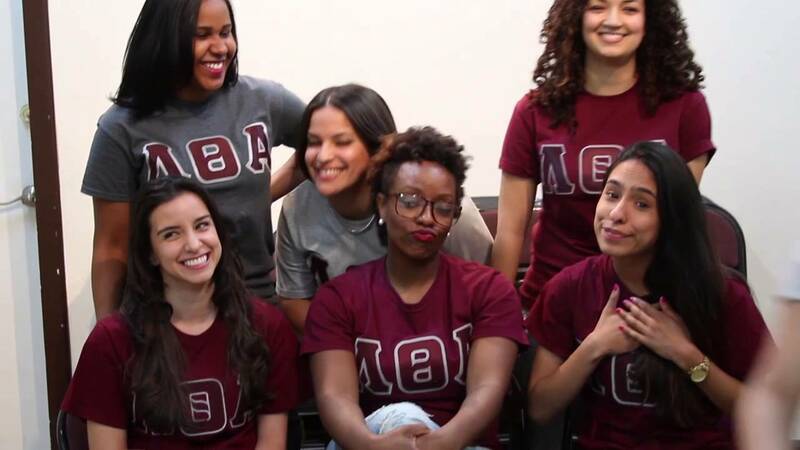 You need to make sure you’re on track so you don’t end up doing a fifth year. It’s a huge transition from high school, so make sure you’re aware of your options and you know what to do. INVOLVE YOUR FAMILY. As a first year, I thought I could do it all myself. However, I still talked to my parents about their opinion(s) on which classes to take, even though I was the first one to go to college. Don’t try to do everything yourself, involve your parents and siblings and try to explain things to them so they understand and can help you out. JOIN ORGANIZATIONS, INTRAMURAL SPORTS, GO WORK OUT, ETC. The goal here is to make friends. You did it in high school, do it again! You’ll meet many people and who knows, if you meet someone in your major they’ll be able to give you advice on professors, classes, homework, etc. GO TO OFFICE HOURS. Meet with your professors if something doesn’t make sense, or if something does make sense! Let them know about your issues, or likings about the class and introduce yourself. They’re there to help; take advantage of it. BE PATIENT. Sometimes it’s difficult for your family to understand that you have work to do, or that you can’t go home as often as you’d like because you’re swamp with papers/exams. 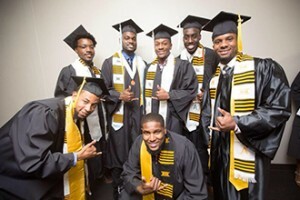 Talk to them and explain what the classes entail and require from you. With time, they will understand and get the hang of it. MAKE FRIENDS. Meet other people who are also first generation students. There will be days when you don’t know where to run and it’s always nice to have someone there. These continue to work for me! MAKE THE BEST OUT OF YOUR UNDERGRADUATE EXPERIENCE. The time has come. The battle will soon begin. Who has the moves to win? You be the judge. 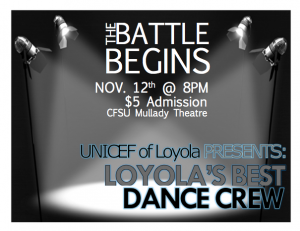 UNICEF of Loyola will be hosting the second annual Loyola’s Best Dance Crew on November 12! 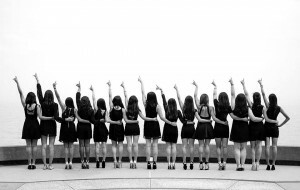 The event invites dance groups on campus to bring their best moves to compete for the title. The $5.00 admission gets you a ticket that can be used to vote for your favorite crew. The winning group will receive a trophy and eternal bragging rights. All proceeds will benefit the United States fund for UNICEF. This is a leading global non-profit that works to end preventable child deaths around the world. UNICEF specifically targets things like clean water, sanitation, vaccinations, maternal care, and education. 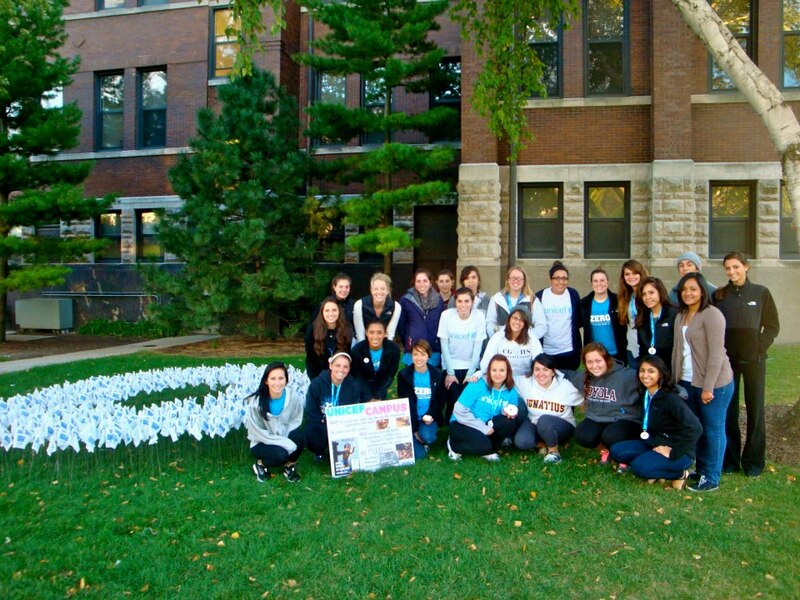 Our chapter raises money and awareness for this cause. So with a great event and an even greater cause, how can you say no? Be sure to check it out! This past Sunday, the second annual Christmas on Campus event got underway here at Loyola University Chicago. 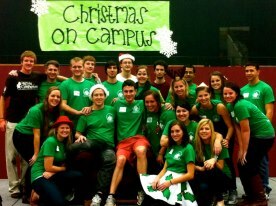 Just like last year, Santa Claus made his special appearance, along with 40 Loyola student organizations. All in all, over 130 Loyola students buddied up with over 100 Chicago Public School children to tour the Gentile Center-turned-Winter Wonderland. Among the numerous activities filling the concourse of Gentile were snowflake making with the Loyola Ultimate Frisbee team, basketball dribbling drills with the Loyola Women’s basketball team, seed planting with the Growers’ Guild, the candy cane walk with SAE and many, many more activities. Also adding to the festivities was the Loyola break team team SCORCH, who showcased their impressive dance moves, the Sandy Pilgrims, a local Loyola band who played a combination of Christmas classics and contemporary Christmas creations and Christmas-themed Zumba. Perhaps the highlight of the day came when all of the students, Loyola and CPS, gathered together to watch Magician Chris Bohne perform his many impressive magic tricks, including an escape from handcuffs inside a locked trunk. All in all, everyone went home, happy if not tired, from a day of holiday activities. Many carried with them handmade creations from the day, but all carried with them memories, new friendships, and a generous Christmas spirit. 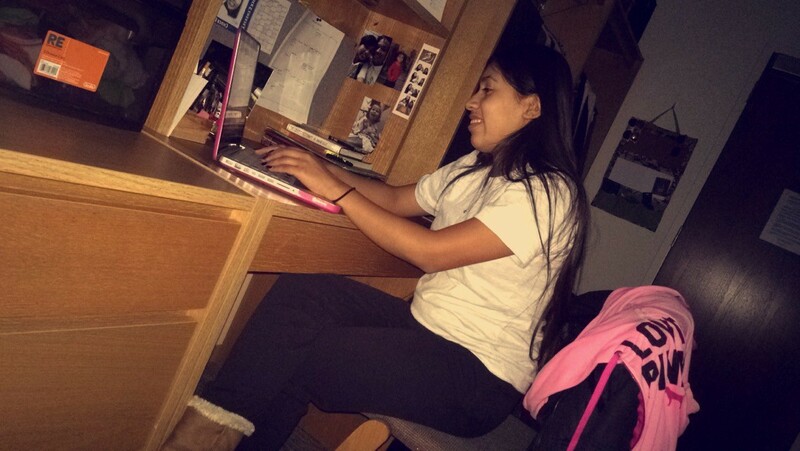 (Pictured above is the core team of Christmas on Campus planners; photo courtesy of Alex Boesch). 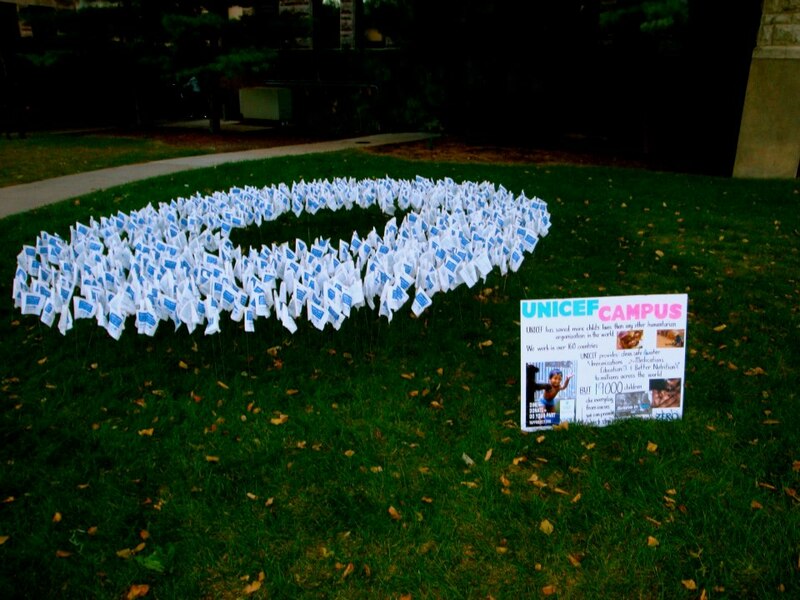 One of the student organizations that I am involved with here at Loyola is UNICEF. 19,000 children die every day of preventable causes and UNICEF fights for this number to become zero. UNICEF has saved more young lives than any humanitarian organization in the world. 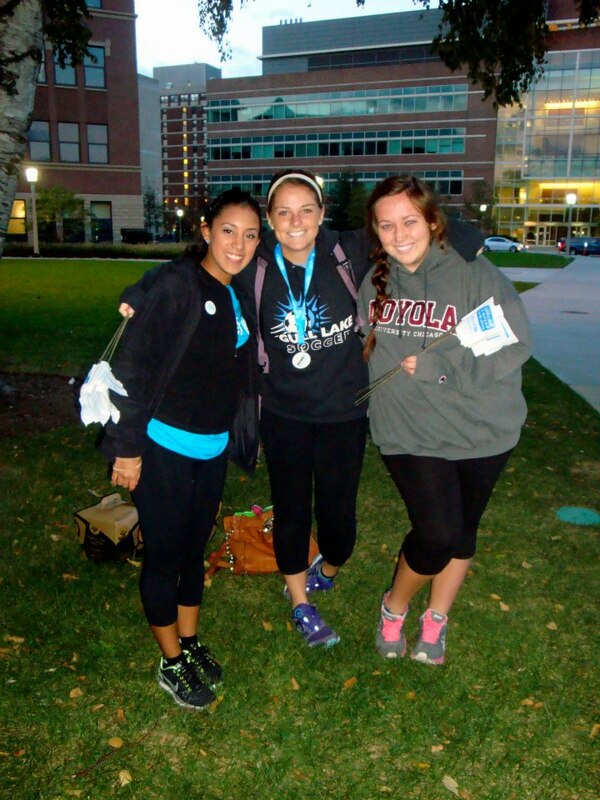 Loyola’s chapter of UNICEF meets every Wednesday night at 7:30 p.m. for one hour. In these meetings we talk about some of the problems that we want to focus on and brainstorm ideas for how we, as a student organization, can fight them. 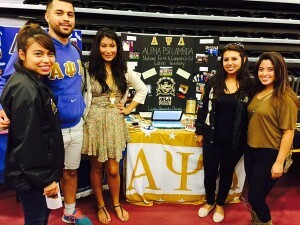 Our main goals are to raise money and raise awareness. To do that, we organize many different projects throughout the year such as documentary nights, professional panels, Mr. Rambler pageants and many more. Our first event of the year was our Believe In Zero flag. 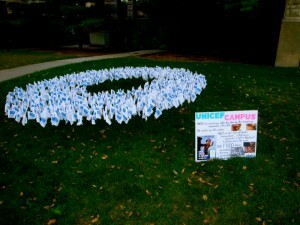 It was primarily to raise awareness for UNICEF and our mission. Our Believe In Zero project involved getting up at the crack of dawn and creating a big “0” out of little white UNICEF flags. 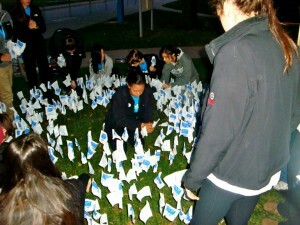 Each of the 600 flags represented 32 children in the world who would die that day from preventable causes. As you can see from the pictures below, it was a pretty powerful sight. This was a great way to spread awareness for organization. We made the “0” in a place where many students passed it on their way to class or the library and many students stopped to see what it was about. We handed out fliers and put up signs around the flags explaining their meaning to help the students understanding. Our UNICEF team with the finished "0"
The Believe In Zero "0" made out of UNICEF flags. Our group working on building the Zero around 6:30 am. Iliana, the president of Loyola's UNICEF, and a couple of us team members. 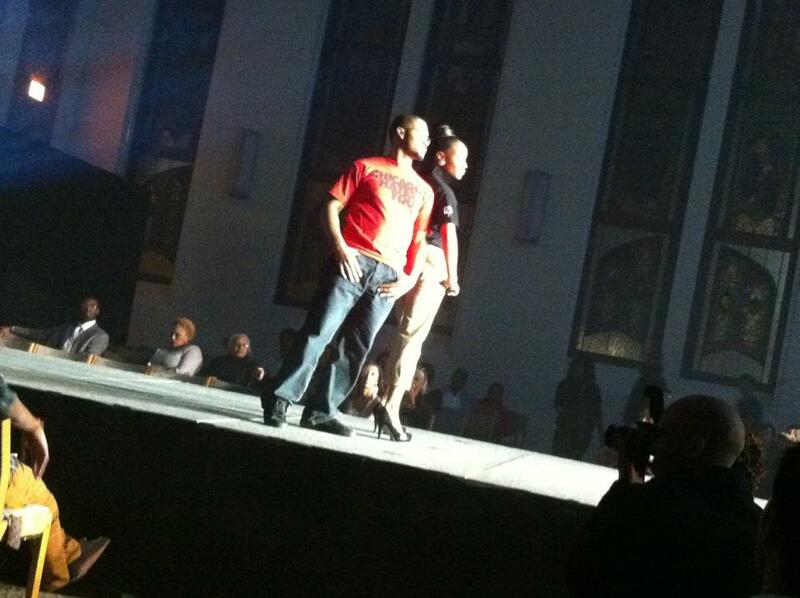 On March 31, 2012, I had the joy of participating in the Loyola University Chicago Black Cultural Center‘s fifth annual fashion show. This is my second year participating as a model. It is always a great opportunity to be involved in a collaborative effort like this, because along with the hard work, I get to meet new people, especially first year students. In preparation for the fashion show, we work with a consulting company. They help us find local designers to wear clothes for the show, and they train us to walk and pose like professional models. It is always nerve wracking in the beginning, especially for me, because I can be shy. But the confidence does come out eventually, and practicing for the show ends up being a lot of fun. This year, we were able to wear clothes from Plato’s Closet, Enstrumental (photographed above), That Girl Boutique and many more. We even featured a swim suit fashion line for the first time. The staging and lighting were great, and the audience enjoyed the show as well. 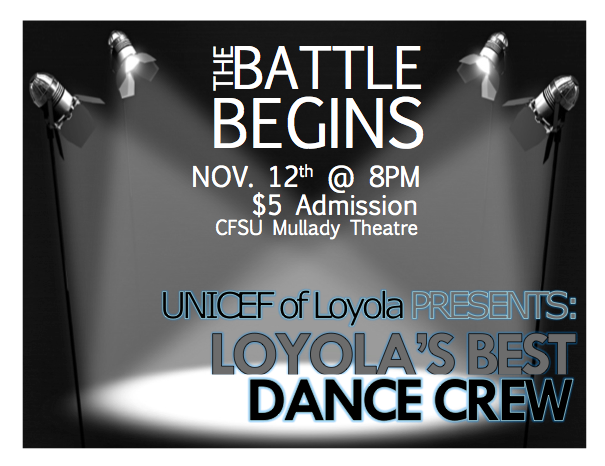 This is an event that I definitely look forward to at Loyola every year.